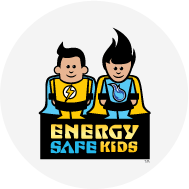 Energy Safe Kids(ESK) has a variety of program components and materials to help your organization build an effective strategy for energy safety. Natural gas use and electricity use have become essential parts of our daily lives, but proper safety education is often not addressed until it is too late. ESK will help your organization reach a wide range of ages and audiences with safety messages that make homes, schools and neighborhoods more safe. Exciting presentations, experiments and award-winning teaching materials all with the ability to be custom-branded, make ESK a great option for any organization looking to conduct safety outreach. Students and their families will benefit from the ESK school-to-home approach as important safety messages reach the entire household. The more energy we use the more important energy safety is and NEF will help develop an ESK program perfect for your organization.